To conduct a credit training program for the credit staff of the State Owned Commercial Banks, (SOCB’s) under an Asian Development Bank T/A . Developed a two-month training course on Credit Risk Appraisal and Credit Risk management. Delivered two full time, two month courses at the Dong Dok Bank Training Centre in Vientiane. Took Students on field trips to Vientiane factories, businesses and farms for loan appraisal and review report writing exercises. Developed bank lending manuals based on the course materials. 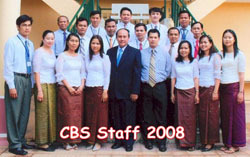 Owned by the Cambodian Central Bank (The National Bank of Cambodia) , the Center for Banking Studies (CBS) provides up to 300 fee paying students with a two year training course leading to an Associate Degree in Banking. This ADB assignment required a curriculum review and the development of improved training materials in Microfinance. for Banking studies for its two year Associate Degree in Banking. review of future business strategy for the CBS. training programs and facilities in Cambodia. Two new teaching modules in Microfinance Supervision, MFI Business Management and Loan Risk Management were developed for adoption by the CBS into its teaching curriculum.